In 1851 Olive Oatman was a thirteen-year-old pioneer traveling west toward Zion, with her Mormon family. Within a decade, she was a white Indian with a chin tattoo, caught between cultures. The Blue Tattoo tells the harrowing story of this forgotten heroine of frontier America. Orphaned when her family was brutally killed by Yavapai Indians, Oatman lived as a slave to her captors for a year before being traded to the Mohave, who tattooed her face and raised her as their own. She was fully assimilated and perfectly happy when, at nineteen, she was ransomed back to white society. She became an instant celebrity, but the price of fame was high and the pain of her ruptured childhood lasted a lifetime. 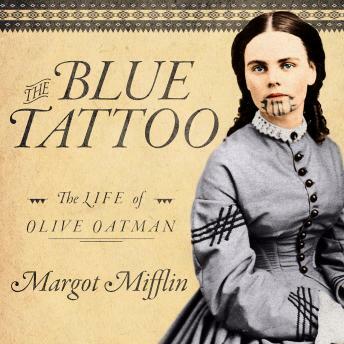 Based on historical records, including letters and diaries of Oatman's friends and relatives, The Blue Tattoo is the first book to examine her life, from her childhood in Illinois-including the massacre, her captivity, and her return to white society-to her later years as a wealthy banker's wife in Texas.